The board is placed with a dark square in de lower left corner. Yourturnmyturn.com makes sure it is placed that way. The player playing the white men begins the board game. You can move your men each turn one move diagonally forward. That can either be diagonally to the left or diagonally to the right as long as you don't move outside of the board. The square you move to also has to be empty. With draughts only the dark squares are used. This moving of your men is allowed as long as you don't have to capture one of your opponent's men. Capturing is possible if a man of your opponent is standing next to one of yours (diagonally in any of the 4 directions) and the square behind that man is empty. Capturing is compulsory. At yourturnmyturn.com this is automatically forced, so if you think that you are not able to make a move, that is most likely caused by a situation that you have to capture. Capturing is allowed in both forward and backward direction. During the capturing of multiple men it is possible that you capture first forward and than backward. When you can choose between capturing in different ways you have to capture the highest amount of man you can. A king is in this situation not more than a man. If you can capture the same amount of men either with a king or a man you may choose which one you use. Above you see an example where a white king can capture all four black men in 2 ways. In both ways he has to pass at least one empty square in order to be able to continue the capturing, and than he may choose to follow either the red line and capture all four men that way or to continue 2 squares further and follow the green line. 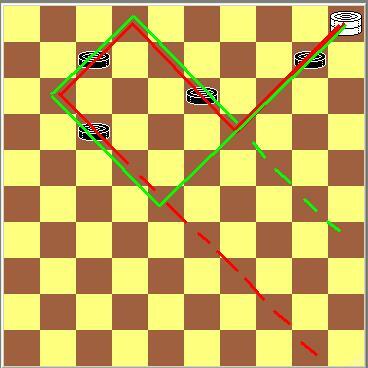 After capturing all four men the white king can finish his move on any of the fields marked by either the red or the green dotted line. You make a king when your man finishes his move on the top row of the board either by a move or a capture. If you reach the top line during a capture but you have to continue your capture your man won't become a king. With a king you can move much further than with a normal man. You can move diagonally to each free square, as long as you don't come across an other man. You have lost when you have no pieces left or when you can't make a legal move anymore because all your men are blocked by your opponent's men. You can also lose by resigning, for instance when you are so far behind that it is useless to play on. After 5 moves from each player in a position of 1 king versus 2 pieces including at least 1 king. After 25 moves from each player where there has been no capture and is only moved by kings. When the same position occurs for the third time in the board game with the same player to move. If your opponent keeps on playing although you think it is a draw according to these rules, contact an admin of yourturnmyturn.com. He can declare the board game a draw if the rules apply.